Isco has been one of those big-name players who has lost his prominence with the team this season. It was supposed to be a great season for the Spaniard as Julen Lopetegui shares a great bond with him but the sacking of the Spaniard has put Isco in trouble. And now, according to Tuttosport, both Manchester outfits and Liverpool are eying a move for the midfielder. Isco was finally brought on to play after a long time when he took on the pitch as a substitute against Barcelona in the recent Clasico. He has played only 624 minutes in the league so far this season and he ranks 18th in the list of most minutes played for Madrid in the league. As a result of such a treatment, there have been suggestions that the former Malaga star could quit the Bernabeu to move to pastures new. According to the report, Juventus are also another club looking to sign the Spaniard. They, however, have competition from Liverpool, Manchester United and Manchester City. Isco’s problems are with Santiago Solari, and there is almost no chance that the Argentine is going to be the Real Madrid manager next season. In that case, Isco might not move because, as was evident in the last game, Real Madrid fans still love the Spaniard and that might just be enough to keep him at the Bernabeu. 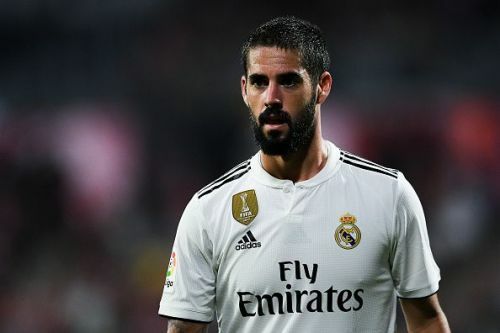 With Solari at the helm, it is unlikely that Isco would get much of chance in the remaining part of the season. Real Madrid have only the Champions League to play for and Solari will most likely use his best possible XI in Europe – and that doesn’t consist of Isco.